We attended our first concert of the season, a guitar performance by Ángel Romero and Eliot Fisk at the wonderful Benaroya Hall venue. The two virtuosos lived up to their impressive reputations. Ángel Romero comes from the world-renowned Romero family and played several compositions by his father, Celedonio. I was impressed with how at-one he was with the instrument. The guitar was just an extension of his body and Ángel seemed to exert no effort to keep it in his grasp. Neither Trisha nor I had heard of Eliot Fisk before but he too has impressive credentials. He was one of the last students trained by Andrés Segovia (whom I had the pleasure to hear in concert some twenty years ago) and has been performing professionally for nearly thirty years. The highlight piece of the evening was Mr. Fisk’s solo of Isaac Albéniz‘s “Asturias” from the Suite Española, Op. 47. Hearing it played without an orchestra was a unique experience. I was surprised –I’m not sure why– to read this morning that PC Magazine is ceasing its print version and becoming an online-only publication following in the steps of InfoWorld that became digital-only in April of ’07. I recall how I used to dig through every new issue trying to keep up with new applications and find still another geeky tip. Now I also realize I haven’t held the paper version in my hands for years while I look at PC Mag articles online often. I’m sure more old stand-bys will follow and go the Web-only route. 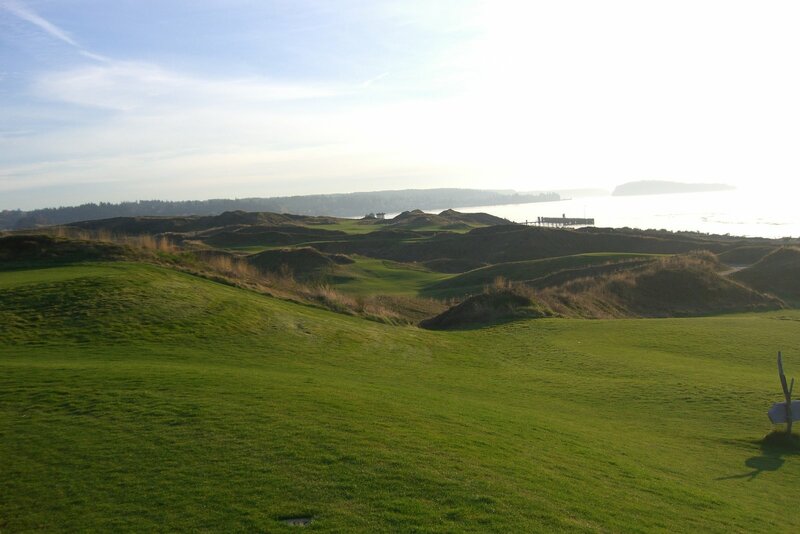 I’ve been wanting to play the new Chambers Bay course near Tacoma since it opened a little over a year ago. It will be the site of several major tournaments in the future (including the 2015 U.S. Open) and I wanted to see what a top-level PGA course is like. We played 36 holes, using the first time through the get acquainted with the layout and greens. I improved each nine holes but was still was appropriately humbled shooting a 101 in the afternoon round. That said, I didn’t play as well as I have been lately and I managed a respectable 47 on the final nine with pars on three of the last ten holes. The greens are exceedingly difficult and I didn’t have a single one-putt hole. It was all still great fun on an exceptional fall day; I even got a little sunburn on the nose. Not bad for the middle of November. And the views are tremendous. Too much mousing around in Excel has finally taken its toll on my poor index finger. The unfortunate digit was constantly sore and so swollen and stiff in the morning I couldn’t flex it at all. After a quick check and x-rays I was told I have “trigger finger” (Stenosing tenosynovitis) and was referred to a hand surgeon. After an injection of steroids the abused tendon seems good again. 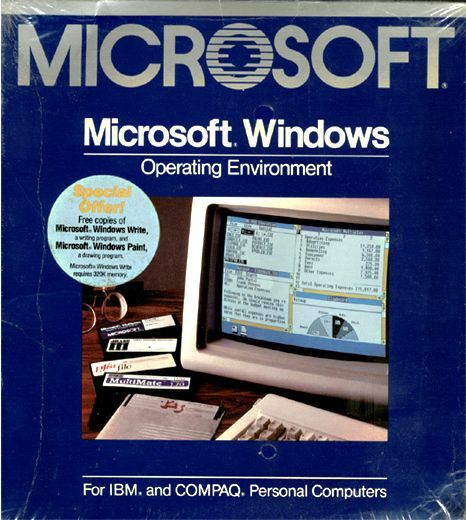 November 10 marks the official 25th anniversary –maybe it’s “birthday”– of the Windows operating system. That’s the date in 1983 on which Bill Gates announced the forthcoming graphical user interface extension to MS-DOS (less than a month, btw, after the first release of Word). Of course, the actual release of the product didn’t happen until November of 1985 establishing an ever-recurring pattern of Microsoft product releases. I can still remember the front page headline in InfoWorld: “Microsoft Does Windows.” It wasn’t quite so exciting news for me at the time since I was still running our first CP/M based computer. I could never have imaged then that a little over ten years later I would be working in the Microsoft empire. My handicap index actually improved by 0.1 over the past two weeks so maybe I’ll be able to finish the golf year under 15.